This project is so simple it made my one-step style-hacks category! If you need a light fixture that is just a bit “more” than average- this might be the perfect project. At home in nurseries or girl’s bedrooms, It added a snowy woodland forest feel to my elegant grey on grey master bedroom at Hawk Hill. I felt like it helped balance my bedroom from top to bottom, which is difficult sometimes in rooms with high ceilings. This project was completed by adding 6-10 short branches to form a sort of wreath that rested upon the arms of the chandelier. I liked the effect of branches clipped in late winter/early spring- the stark branches just beginning to bud had a nice effect. Though impossible to clean, when I felt like this light fixture was too dusty to be reasonably cleaned with a feather duster, I just clipped new branches! 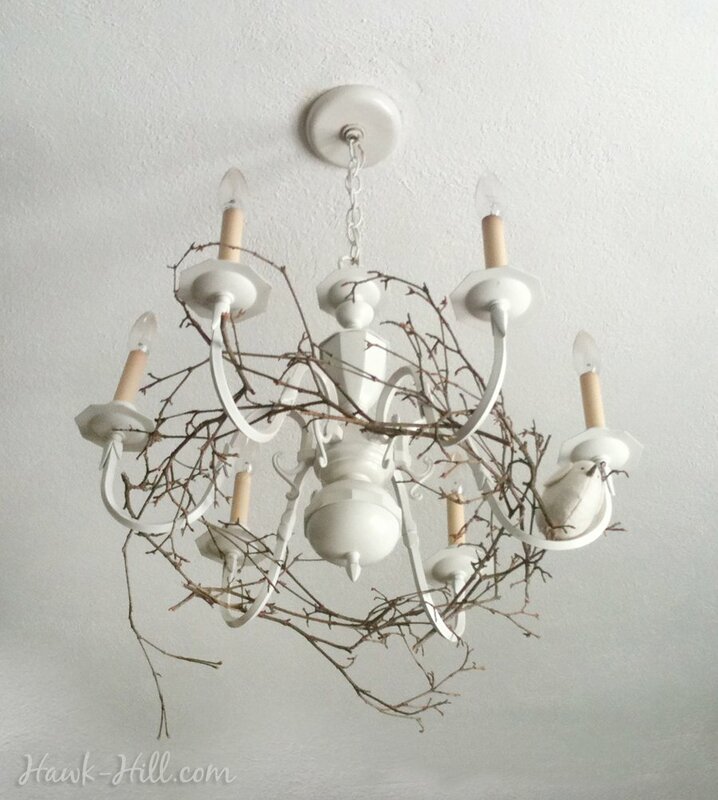 My woodland inspired chandelier upgrade, featuring a wreath of branches and a tiny bird, resting on the chandelier arms.